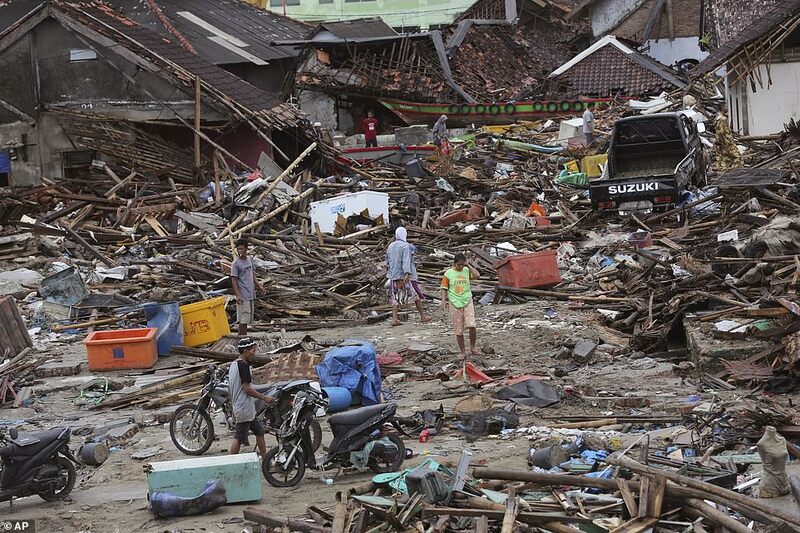 The death toll from the Indonesian tsunami rose to 429 on Monday night as 128 people were missing after the disaster. The search and rescue operations will last until Sunday else alive. 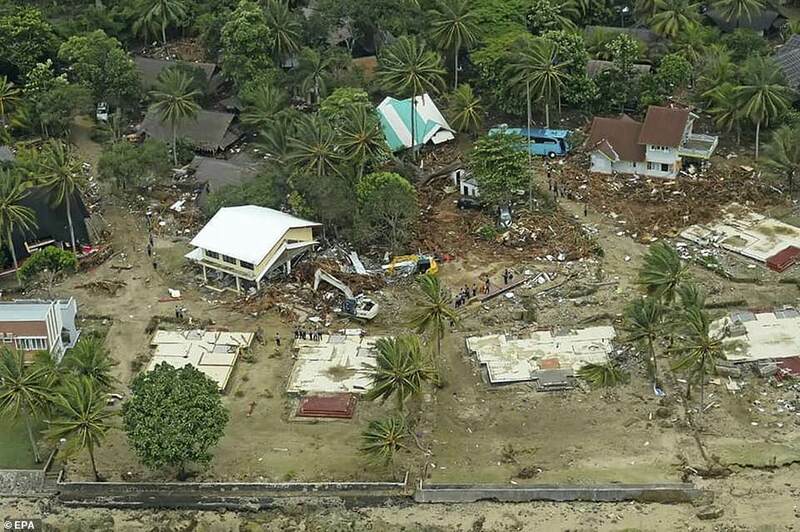 Efforts will now focus on providing medical care to the 1,400 casualties caused by the tidal wave triggered by an eruption of the "Child of Krakatoa" volcano on Saturday, and seeking shelter for the 16,000 whose houses were destroyed. But pouring rain hampered these efforts on Christmas day, making search queries difficult and disabled ambulances to bring corpses out of the disaster area. Pastor Markus Taekz said Tuesday his Rahmat Pentecostal Church in Carita did not celebrate with joyful songs this year. 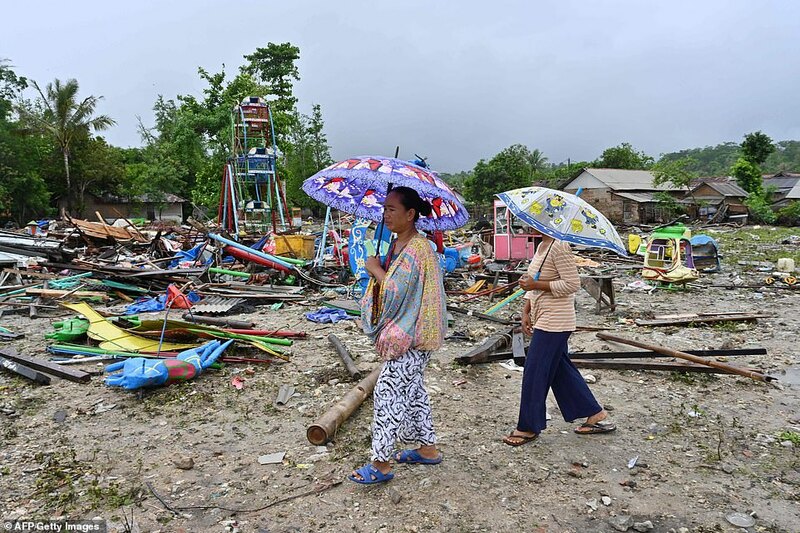 People inspect the damage in a tsunami devastated village in Sumur, Indon on Christmas day. Instead, he said only about 100 people came to church for Christmas, usually twice as many , Many parishioners had already left the area to leave the capital, Jakarta, or other locations outside the impact zone. 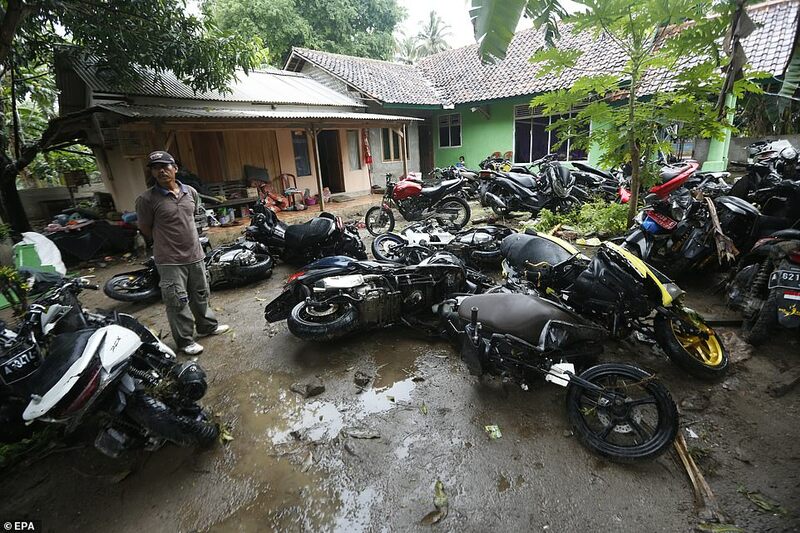 "This is an unusual situation because we have a very dire catastrophe that killed hundreds of our sisters and brothers in Banten," he said, referring to the province of Java. "Our celebration is so full of sadness." 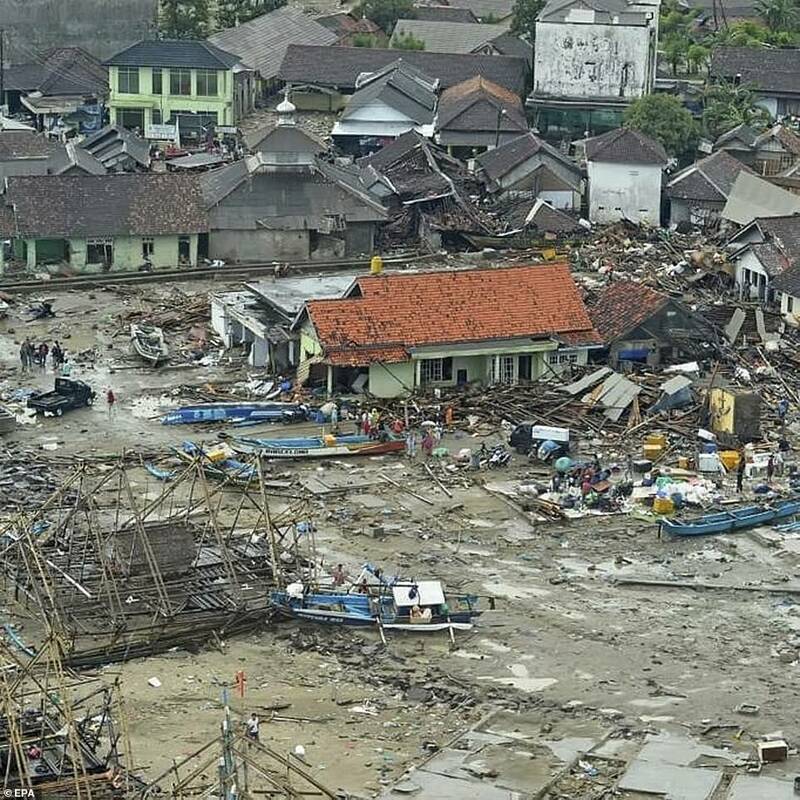 Church leaders called on Christians throughout Indonesia, the world's most populous Muslim nation, to pray for the victims of the tsunami. 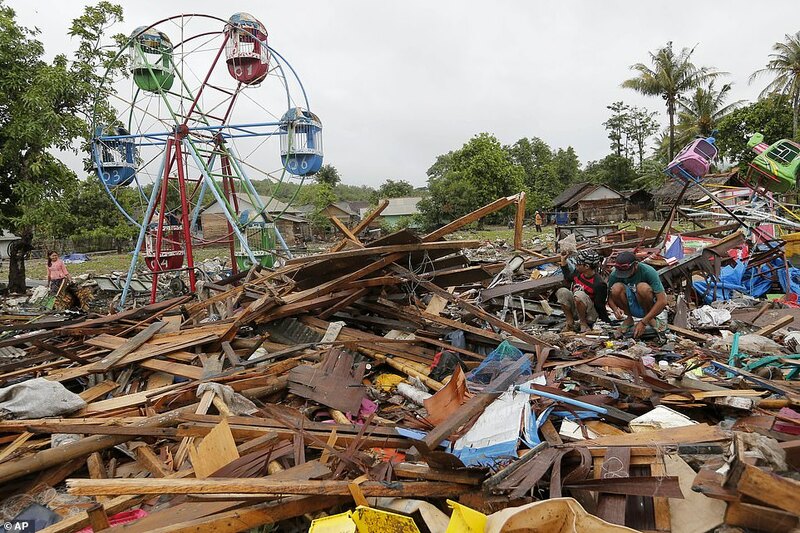 Sutopo Purwo Nugroho, spokesman for the Indonesian Civil Protection Agency, said there was an urgent need for heavy equipment in a remote area of ​​Sumur, a hard-to-reach area near Ujung Kulon National Park, which suffered severe damage. Some villages were cut off for damaged roads and bridges, making it difficult to provide relief supplies and help people who may be injured or trapped. 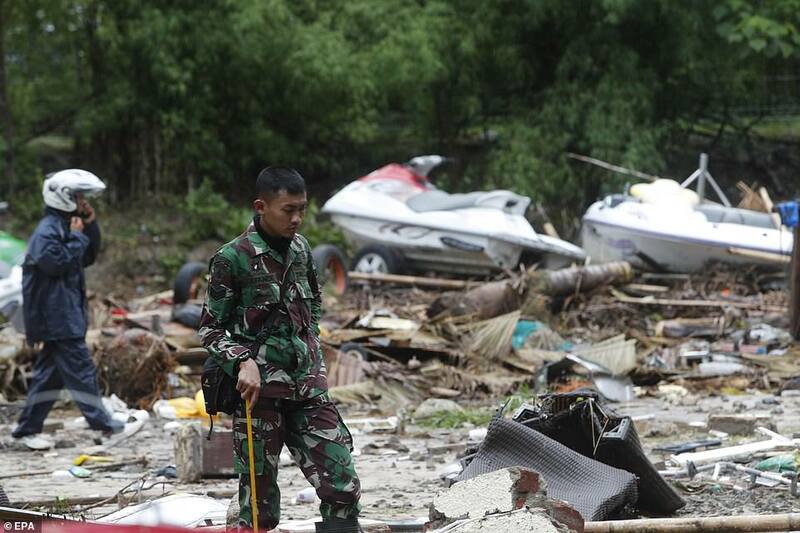 Military troops, government personnel and volunteers were searching for beaches dotted with debris. Where victims were found, yellow, orange and black body bags were placed and weeping relatives identified the dead. 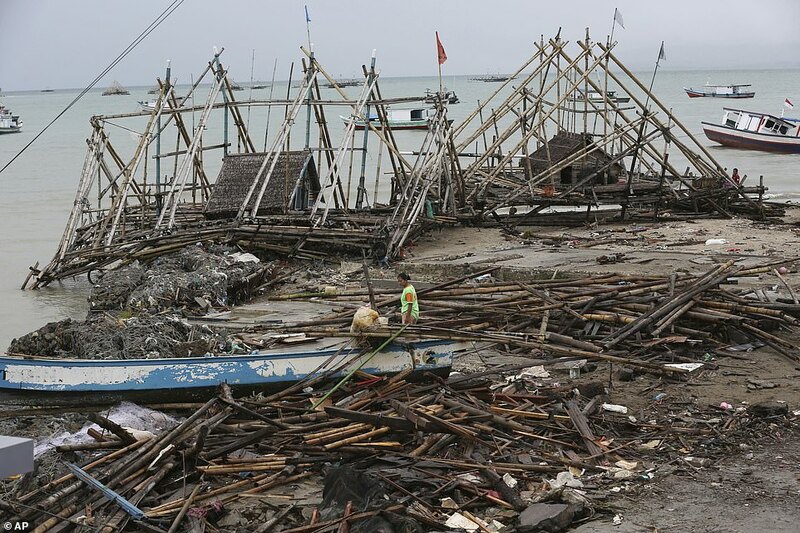 Chunks of broken concrete and shattered wood lay on the coast, where hundreds of houses and hotels had stood. 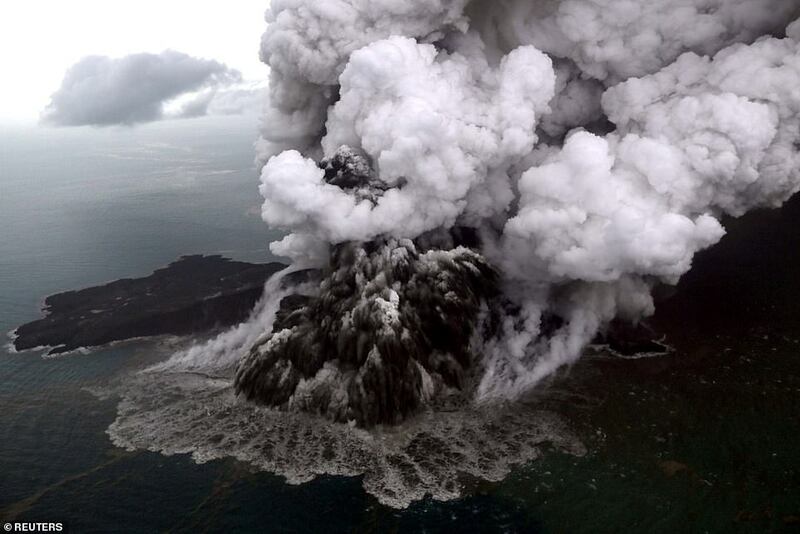 The waves followed an eruption and obvious landslide on Anak Krakatau or "Child of Krakatoa," a volcanic island which formed at the beginning of the 20th century near the catastrophic eruption of 1883 by Krakatoa would have. 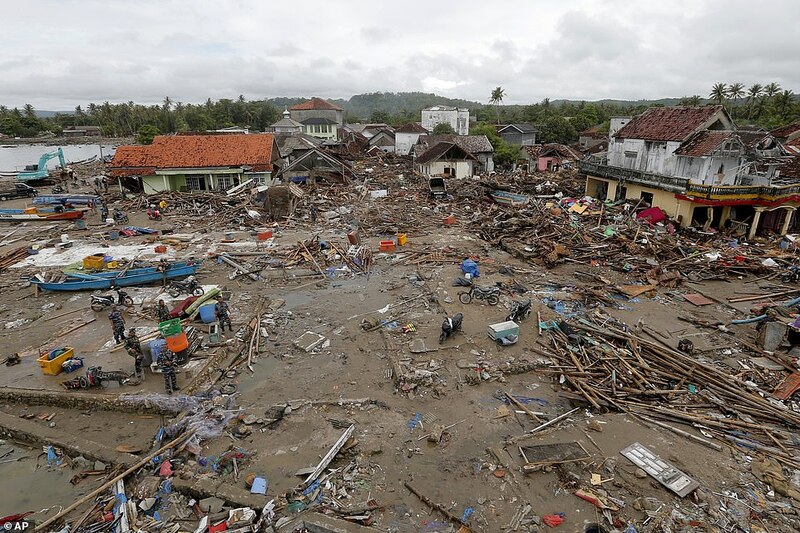 Indonesian President Joko Widodo, facing a tough re-election campaign next year, promised that all tsunami detection equipment should be replaced or repaired. Nugroho confirmed on Twitter that the country's network of detection buoys had been out of vandalism and budget deficits since 2012. 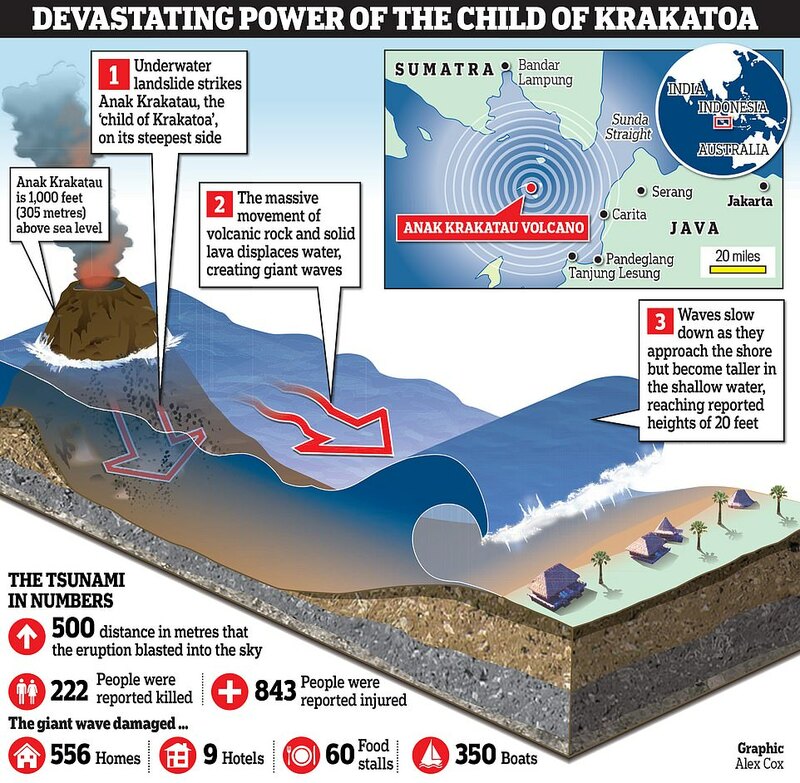 Dwikorita Karnawati, head of the Indonesian Meteorology, Climatology and Geophysics Agency, said that the tsunami was probably due to Krakatov's Olympic activity and therefore could not be picked up by agency sensors monitoring conventional earthquakes for more than 90 percent of the tsunamis in Indonesia are responsible. 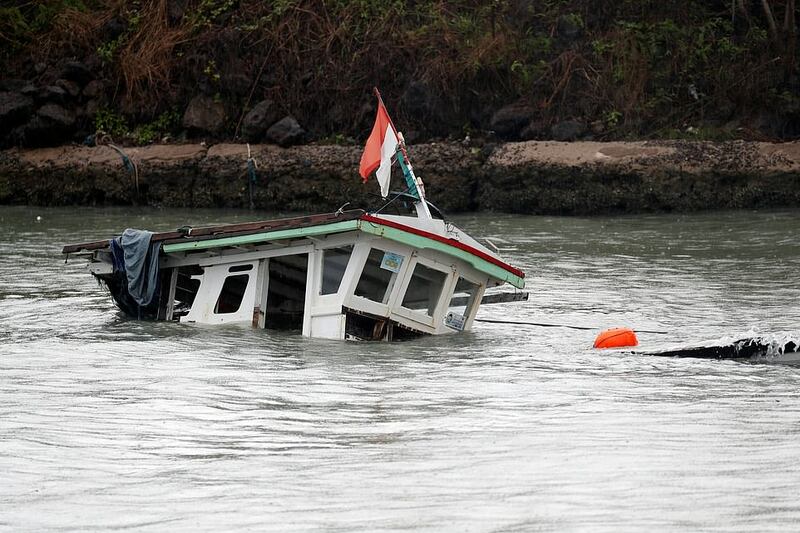 Karnawati said the tsunami was probably caused by the collapse of a large section of the volcano. 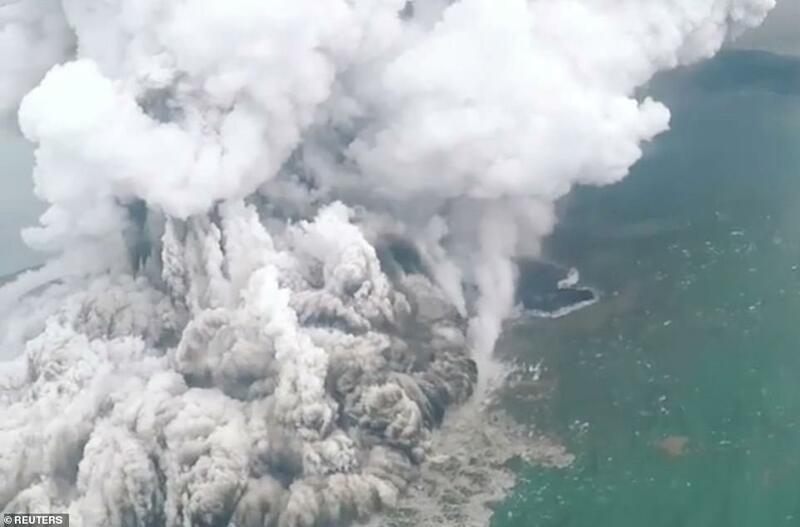 Anak Krakatau broke out in June and did so 24 minutes before the tsunami, the geophysics agency said. Other scientists have said a submerged landslide could also have contributed to the disaster. Indonesia, a vast archipelago of more than 17,000 islands and home to 260 million people, is located on the Ring of Fire, an arch of volcanoes and fault lines The Pacific Basin. In the massive eruption of Krakatoa, more than 30,000 people were killed and so much ash was thrown that it hit the region day after night and lowered global temperatures. 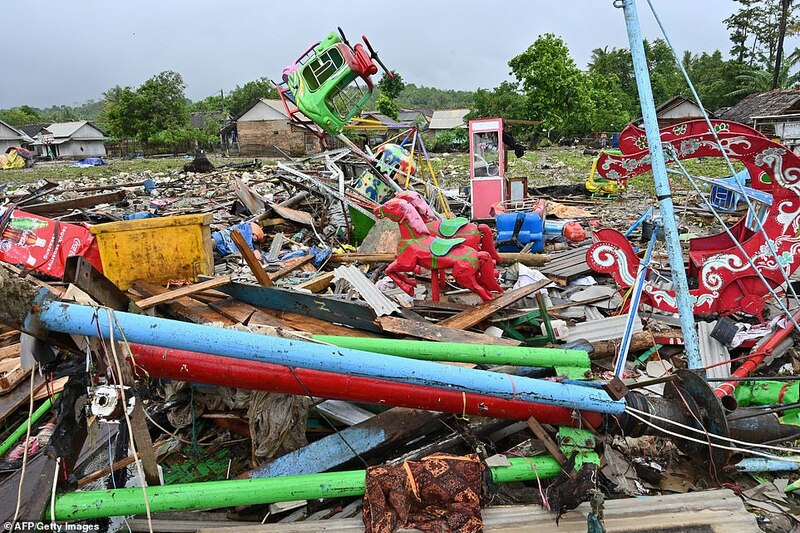 Thousands were killed by an earthquake and tsunami that struck Sulawesi Island in September, and a previous earthquake on Lombok Island killed 505 people in August. A government rescue helicopter shows homes severely damaged by a lack of water, triggered by an underwater landslide. 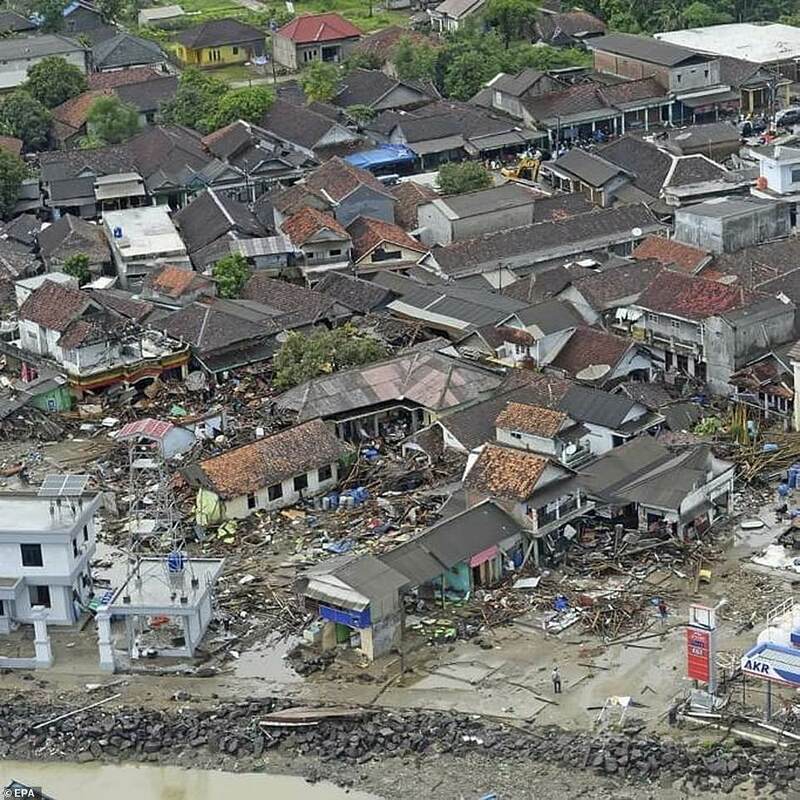 The tsunami at Christmas time brought back memories of the Indian Ocean tsunami triggered by an earthquake on December 26, 2004 which killed 226,000 people in 14 countries, including more than 120,000 in Indonesia. Witnesses Remember A light breeze followed a huge wave that shattered wooden fishing boats offshore. Battered vehicles were hit by a wave in which pieces of metal, felled trees and roof tiles, wooden beams and household items scattered were a crossroads. Some cars ended up on rice fields. Nurjana (20) was half an hour into the mountains after the tsunami. 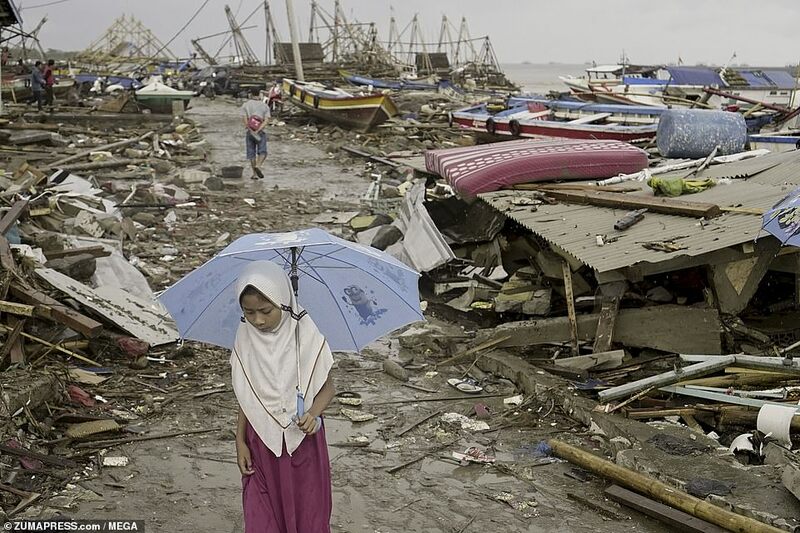 Her beach stall, where she sold snacks to tourists, was washed away. "I immediately opened the door and saved myself. I jumped over the wall, "she told Reuters.
" Everything is destroyed. " Another aerial view of the volcano in Indonesia shows huge clouds of smoke rising into the sky after the devastating eruption. Heavy equipment was used to aid rescue operations. Physicians were sent by military, while groups of police and soldiers reached remote areas. 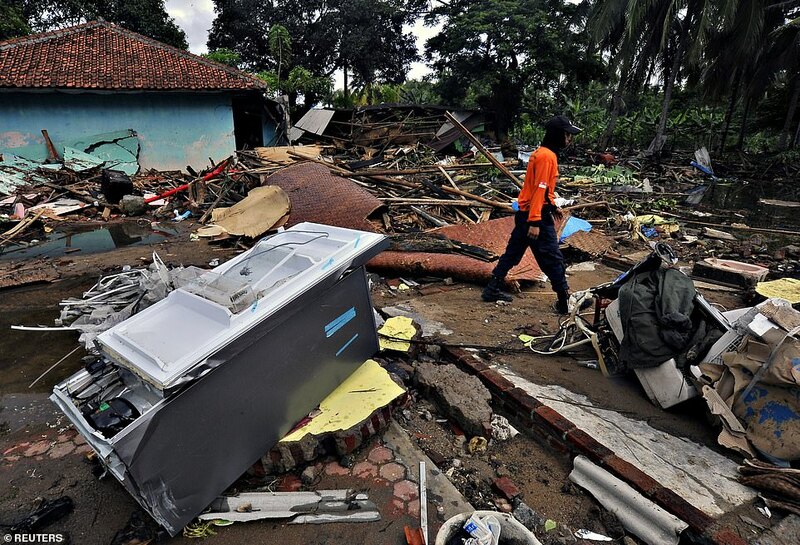 A team of volunteers who had been working on disasters in Lombok and Palu looked eight at Villa Stephanie, one of dozens of beach retreats, after victims were missing. 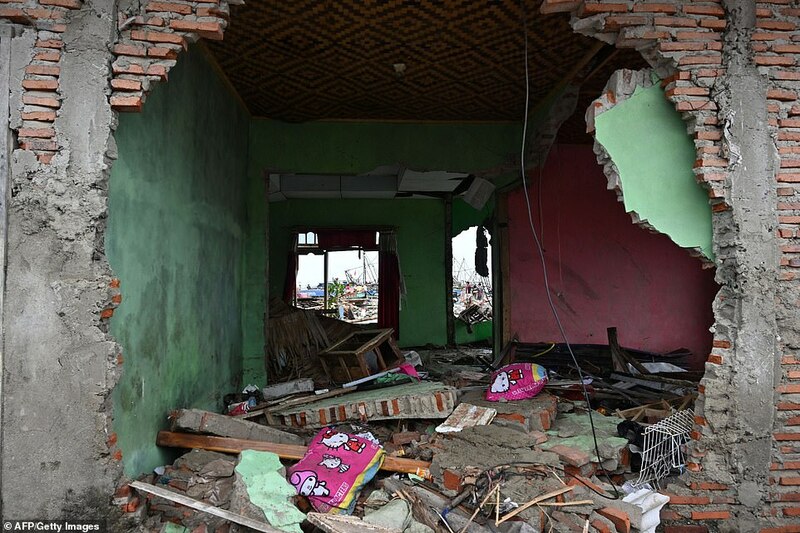 "It's difficult here because it's piled up with rubble," said West Jakarta Tagana chairman Muhammad Idris, who led the team. "This year has been quite busy and the catastrophes were more difficult," he said. At least five bodies were found in this area on Monday. Military and other rescue workers used an excavator to remove cars and debris, including steel piles tangled like spaghetti. 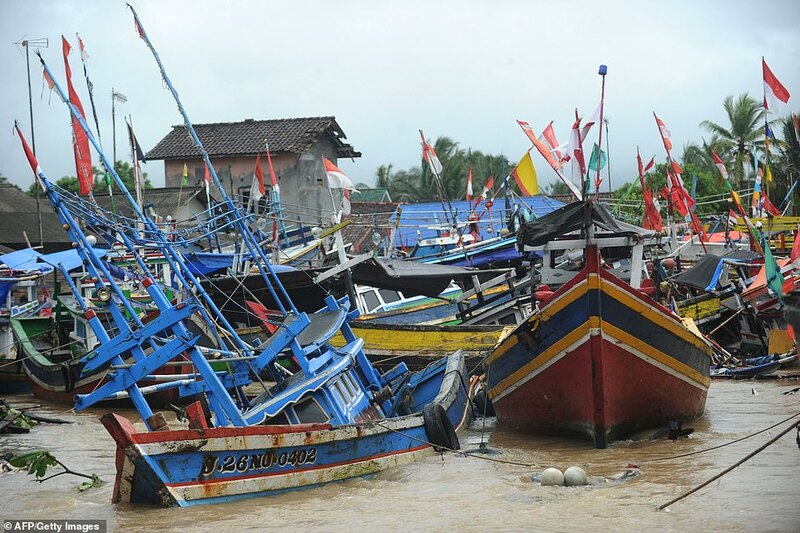 The western coast of the province of Banten in Java, Indonesia's most populous island, was hit hard too. 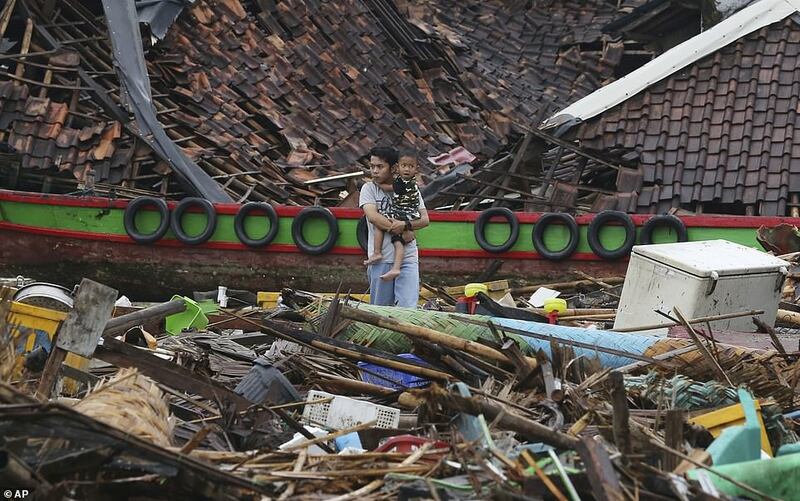 At least 60 people were killed in Lampung, South Sumatra, the disaster agency reported. 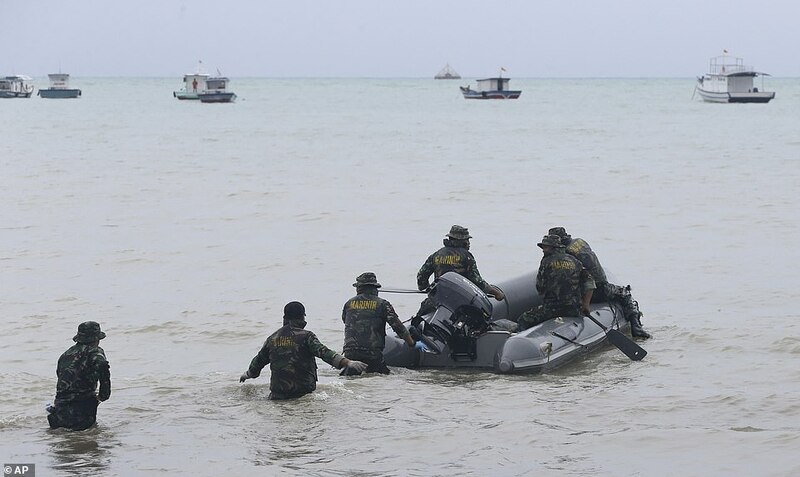 Authorities buried 16 bodies in a mass grave in South Lampung, on late Sunday at the request of relatives, said Colonel Erwin Djatmiko, a military commander there, told Reuters. 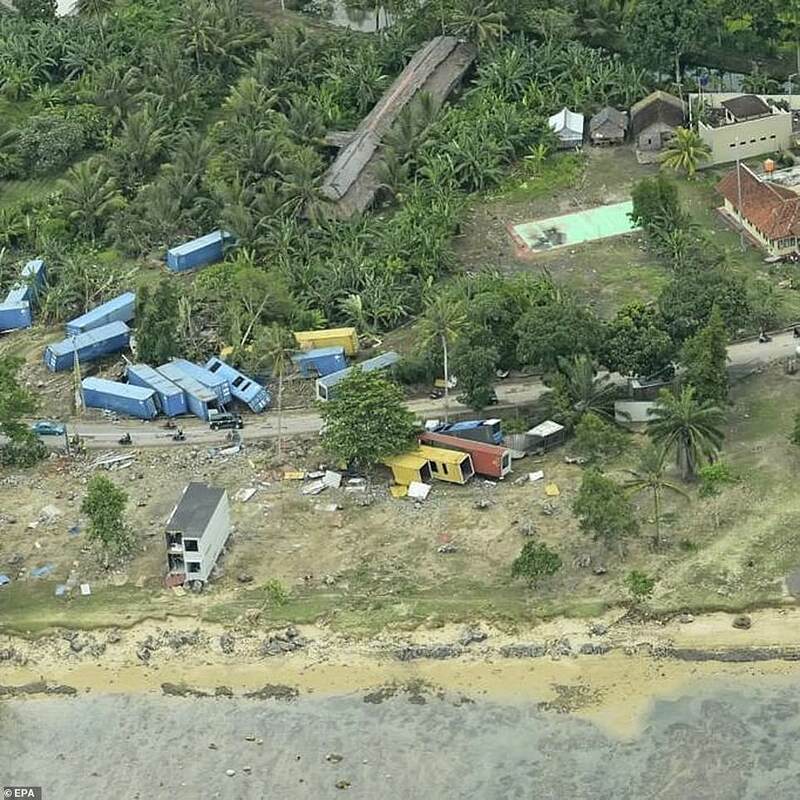 TV recordings showed how the tsunami washed away an outdoor stage on which Indonesian rock band Seventeen acted for hundreds of guests a party for the power company Perusahaan Listrik Negara (PLN). 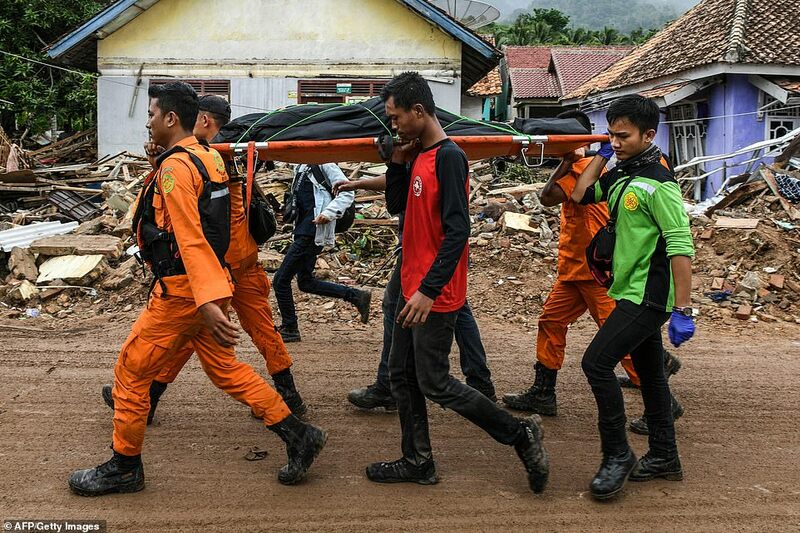 At least four band members and the relief teams were killed, said singer Riefian & # 39; Ifan & # 39; Fajarsyah the followers in a tearful Instagram report. The drummer of the band was among the missing persons. Another 29 PLN employees and relatives were killed. 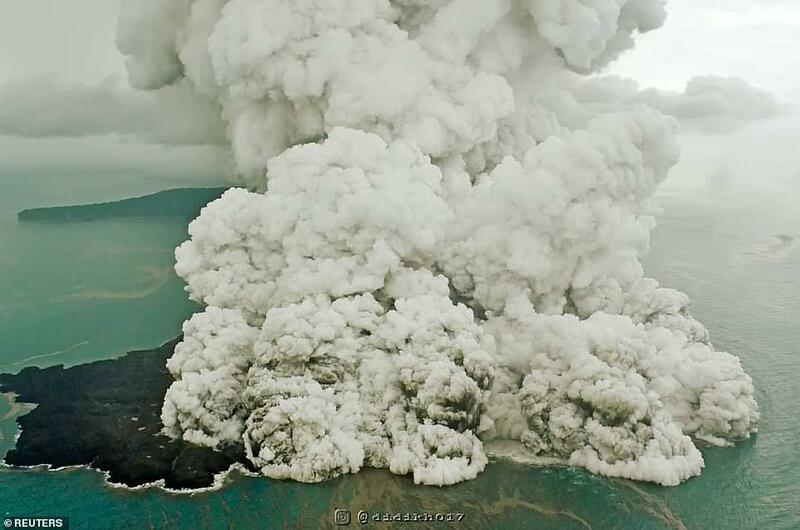 Anak Krakatau left shortly after 9pm. On Saturday, the tsunami struck 24 minutes later. Earthquake geologist Ben van der Pluijm said an underwater landslide would be "like throwing a sand out of sand in a water-filled tub."